Latest: The death toll of China's Qinghai 7.1-magnitude earthquake rose to 589 as of 1:20 am Thursday, according to the local quake-relief headquarters. The headquarters have dispatched relief work groups respectively in charge of rescue, quake survivors' daily life, detecting aftershocks and health and disease control. 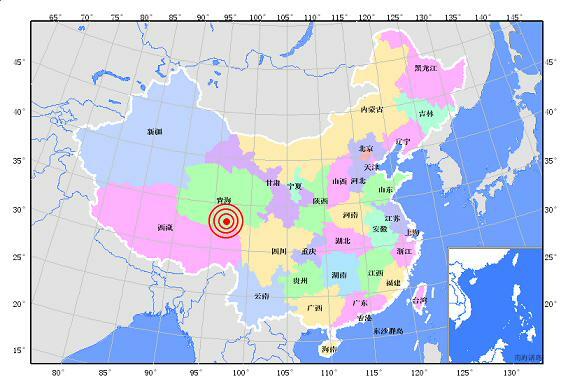 YUSHU, Qinghai - About 400 people have died and 10,000 others were injured after a 7.1-magnitude earthquake hit northwest China's Qinghai Province early on Wednesday, local authorities said. President Hu Jintao and Premier Wen Jiabao have ordered local authorities to go all out to save the disaster-stricken people. Vice Premier Hui Liangyu has rushed to the quake-hit region. Many people are still buried under the debris of collapsed houses in the Gyegu Town near the epicenter in the Tibetan Autonomous Prefecture of Yushu in southern Qinghai, said Huang Limin, deputy secretary-general of the prefecture government. The strong quake and a string of aftershocks, with the biggest one being 6.3 magnitude, have toppled houses, temples, gas stations and electric poles, triggered landslides, damaged roads, cut power supplies and disrupted telecommunications. A reservoir was also cracked, where workers are trying to prevent the outflow of water. Gyegu, also known as Jiegu, is the seat of the Yushu prefecture government. The town has a population of about 100,000, including permanent residents and migrant people. About 700 soldiers are now struggling to clear away the rubble and rescue the buried people, a spokesman with the Qinghai Provincial Emergency Office said. More than 5,000 additional rescuers, including soldiers and medical workers, have been dispatched to the quake-hit region, according to a news conference held by the Qinghai provincial government. Authorities in the neighboring provinces of Gansu and Sichuan and Tibet Autonomous Region have also dispatched rescuers to Yushu. "Our top priority is to save students. Schools are always places that have many people," said Kang Zifu, an army officer in the rescue operation in Gyegu. The quake also killed five people and injured one another in the Shiqu County, which neighbors Yushu, in the Tibetan Autonomous Prefecture of Garze in Sichuan Province, local authorities said. Lying on the Qinghai-Tibet Plateau, Yushu has an altitude of above 4,000 meters. The Qinghai Provincial Observatory forecast Wednesday that Yushu would see strong winds and sleet in the coming days, which would hamper rescue efforts. More than 85 percent of the houses in Gyegu had collapsed, said Zhuohuaxia, a publicity official with the Tibetan Autonomous Prefecture of Yushu. "The streets in Gyegu are thronged with panic, injured people, with many bleeding from the head," he said. "Many students are buried under the debris due to building collapse at a vocational school," he said. "A large crack appears in the wall of the Yushu Hotel, and part of a government office building also collapsed," he said. "I can see injured people everywhere. The biggest problem now is that we lack tents, we lack medical equipment, medicine and medical workers," he said. The epicenter is at the Rima Village in the Shanglaxiu Township, about 50 km west of Gyegu and about 800 km away from Xining, the Qinghai provincial capital. "The epicenter is a pasturing area and sparsely-populated. I think the quake would not cause casualties as heavy as those in Jiegu," Zhuohuaxia said. Zhu Liang, a driver at the Yushu prefecture government, said he saw half of the buildings in the Yushu Vocational School had collapsed. There seems to be no respite in sight from the unusually long winter that has left North China desperate for spring this year. A total of 62 new property projects will start pre-sale in Shanghai in April, up 63 percent from March. I find those TV girls' smiling, jumping, running and dressing are just like little girls.